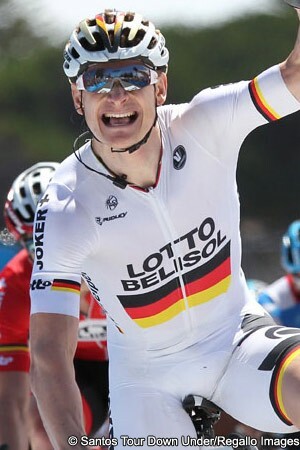 Having clocked up fourteen stages in the race in the past, André Greipel today grabbed Lotto Belisol’s first victory of the season when he placed first in Victor Harbor at the end of stage four of the Santos Tour Down Under. The big German rider had a relatively uncomplicated sprint, coming off the wheel of team-mate Jurgen Roelandts and then speeding in well ahead. Roelandts was able to hold on for second while Elia Viviani (Cannondale) came from a long way back and passed former race leader Simon Gerrans (Orica GreenEdge). The significance of that was Gerrans would otherwise have picked up a time bonus to go along with those he scooped in the intermediate sprints earlier in the day. Those earlier efforts saw him reduce his deficit to ongoing race leader Cadel Evans (BMC Racing Team) from twelve to seven seconds. Had Viviani not got past him, he would be starting tomorrow’s stage just three seconds off the ochre jersey. Still, his win in the intermediate sprint at Euchunga (km 25.5) and runner-up slot at Yankalilla (km 116.6) both improved his chances of overhauling Evans, who will hope to rebuild his buffer on tomorrow’s summit finish atop Old Willunga Hill. “Today it went pretty well with the time bonus I was after,” stated Gerrans. “Our plan was to chase the first breakaway if it was within reach before the first intermediate sprint, and if not, we’d target the second. Greipel was unsurprisingly relieved to notch up his first win of the year, having gone frustratingly close with second to Marcel Kittel (Giant Shimano) in the People’s Choice Classic on Sunday and second to Gerrans on Tuesday’s opening leg of the Santos Tour Down Under. “I was always confident that I’d win something here. 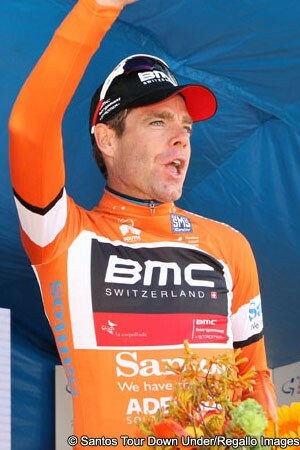 In the inaugural criterium in Adelaide and in stage 1, I just made mistakes but that can happen in sprinting,” he said. “Before today’s stage, I thought this would be the first day for a sprint. Coming first and second says enough of the great work our team Lotto-Belisol has done today. Roelandts was fully committed to leading out Greipel, but had enough left in the tank to grab second place. “I was a bit nervous with eight kilometres to go because we had all the pressure to win,” he said. “We hit that last chicane with André in perfect position and after leading him out, I sat up a bit, but when I saw no one coming around me, I restarted my sprint to finish second. The 149 kilometre stage rolled out of Unley and after 25 kilometres, the first time bonus was up for grabs at the Echunga sprint. Gerrans received a strong leadout from his team and had little problems in nabbing first. Orica GreenEdge team-mate Goss held on for second, thus preventing Gerrans’ rivals from taking that bonus, then Garmin-Sharp’s Nathan Haas came in third. Axel Domant (AG2R - La Mondiale) and the Australian Cameron Wurf (Cannondale) grabbed their chance in the kilometres after that gallop and pushed ahead, starting a long two-man break. Their move saw them scale the Myponga Skoda King of the Mountains, where Domant led Wurf over the top. Further back, Greipel’s team-mate Adam Hansen put in a cheeky dart just before the line, adding four points to his total and thus retaining his lead in the King of the Mountains competition. The speed of the chase plus crosswinds caused the peloton to split and the first half – which numbered approximately 40 riders – caught the two leaders. This meant that the full range of points and time bonuses were up for grabs at the second Adam Internet sprint of the day at Yankalilla, some 30 kilometres from the finish. Gerrans tried to take the full bonus again but was not able to get past Haas. Still, his two second bonus for second was useful and further reduced his deficit. Evans had hoped to dispute the sprint but had bike problems shortly before that gallop. He was able to get back up but lost out due to his being delayed. He said that he considered four of the race’s six stages were more suited to Orica GreenEdge than to him, although he considered two advantageous to his characteristics. He’ll hope to get maximum benefit from the second of those tomorrow. “Of course Willunga will be important,” he said, thinking of the summit finish at the end of the stage. However he’s concerned at the intermediate sprints. “|Certainly if Orica keep going for the intermediate sprints they can eat away at seven seconds pretty quickly. "It’s certainly not my area of expertise and Simon is good in the sprints and has a very, very good team for that.... but we’ll see what happens on the way to Willunga. With the finish line at the top I think everyone is going to be looking at Willunga of course, and it goes back into my area of racing and experience. Gerrans will aim to stick with Evans and, if possible, beat him at the summit. Even if he doesn’t finish ahead of him, he’s continue trying to pick up bonuses wherever he can.